There are several serious challenges the two powers need to surmount if they are to build successful relations. Efforts to build a “new type of major power relations” between China and the U.S. represent a historic initiative, one that will need to overcome a number of challenges, expected and unexpected. In essence, though, the initiative is very much in the hands of these two countries, as are the major challenges and obstacles. We can broadly categorize the challenges into three main groups: cognitive differences, conflicting interests, and diverging priorities. However, the U.S. is suspicious of China’s intentions in putting forward this new idea. 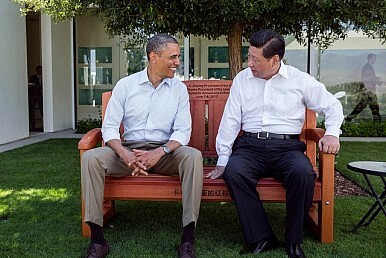 Some scholars cite as reasons for China’s enthusiasm for the new concept three points: (1) China wants equal status with the United States as superpower; (2) China wants the U.S. recognize its core interests; ( 3) China is catering to domestic policy needs, namely fostering stronger nationalistic pride under Chinese Communist Party leadership. As for “mutual respect,” the U.S. is not fully on board, partly because it has a superpower mentality that treats its interests as paramount. More importantly, the U.S. believes “mutual respect” actually means that the U.S. recognizes China’s core national interests, something that is unacceptable for the U.S. From its perspective, China is ambiguous in defining its core interests, especially in territorial disputes. Once the United States agrees with China’s core interests, its interests (such as alliances) in Asia may be compromised. Conflicting interests exist between China and the U.S., reflected not only in trade and economics, but also in ideology. In fact, economic competition between China and the U.S. does not significantly disrupt bilateral relations. But from an ideological perspective, there are fundamental differences in political systems, values, and development paths. These differences are still difficult to bridge, resulting in Sino-U.S. “structural contradictions.” In particular, the United States is strongly driven to promote American democratic values abroad, while China believes it should have the right to explore its own values. In addition, third-party factors have shaped tensions between China and the United States. In the South China Sea, the U.S. is not a party to the disputes, and the U.S. has said it will maintain a neutral position. In reality, though, Washington has repeatedly emphasized that the issue is related to its national interests and has openly supported the demands of countries like the Philippines. On the Diaoyu (Senkaku in Japan) islands dispute, U.S. policy has evolved rapidly. In February 2013, during Japanese Prime Minister Shinzo Abe’s visit to the United States, Obama avoided discussion of the issue. One year later, on April 21, 2014, the president made it clear in an interview with Japan’s Yomiuri Shimbun that the islands fall within the scope of the U.S.-Japan Treaty of Mutual Cooperation and Security. Several days later, at a joint press conference, he reiterated this position. It was the first time an incumbent president had made this proposition. This was subsequently included in the joint statement between the U.S. and Japan. Obviously, third-party factors such have these have become deeply embedded in Sino-U.S. relations, becoming an important variable affecting the development of bilateral relations. China and the U.S. have a consensus on the stability and development of bilateral relations, but they have different ways of thinking about how to achieve this goal. China hopes to outline a roadmap and determine the direction of development, and then move on to specific operations; the United States starts with the priorities, then gradually accumulates a consensus, and establishes a development vision. In other words, China pays attention to the macro design first; the United States pays more attention to specific cooperation to promote the development of bilateral relations. Beyond that, the two sides set different agendas. For China, the priority is to make a clear statement on core interests such as sovereignty, security and development, which lays the foundation for cooperation. But the United States sees China’s core interests themselves as controversial, and thinks the two sides ought to cooperate on specific issues and foster mutual trust in the process. In early 2014, Evan Medeiros, Senior Director of Asian Affairs of National Security Council, spoke about how to advance U.S.-China relations at the Brookings Institution. In this view, the common challenges include climate change, nonproliferation, global growth, and energy security. However, this U.S. perception in fact represents an obstacle to building a new model of Sino-U.S. relations: On the one hand, China’s experience in its modern history makes it value the core interests of sovereignty, security and development. The fundamental purpose of China’s foreign policy is to safeguard these core interests. Mutual respect for each other’s core interests and major concerns has become a political premise for China in developing relations with other countries, and it is also a distinctive manifestation of China’s independent foreign policy of peace. On the other hand, a number of the pressing issues raised by the United States do not take China’s real needs into account. There is no doubt that these global problems are China’s concerns, but many of them are not the most pressing issues for China to address. As a consequence, to set the agenda solely from the perspective of the United States is not in China’s interest, nor is it conducive to the development of bilateral relations. Obviously, China and the U.S. will need to overcome many misconceptions and contradictions if they are to build a new type of major country relations – the path to the new model of Sino-U.S. relations will not be smooth. But taking that path would meet the expectations and interests of both sides, reflect the times, and fulfill the shared hopes of the international community. The two sides should thus make the effort to expand consensus, facilitate mutual understanding, and build trust through pragmatic cooperation. As the saying goes, “Where there’s a will, there is a way.” And so it goes with building a new type of major country relations between China and the United States. Chen Jimin, Ph.D, is an Associate Research Fellow for the Institute for International Strategic Studies at the Party School of Central Committee of C.P.C. He recently published a book Hegemony Maintenance and China-U.S. Relations in the Post-Crisis Era. The views presented here are his own. What's needed now is long-term messaging at a short summit.